There is something special about food from your own country, the food you grew up with. I love Indian food but being an expat, there are those times when you daydream about food, salivate about food, and when you happen to get your little mits on some imported food, you feel like you’re holding diamonds in your hands. Those who have travelled or lived abroad will understand the cravings you get. 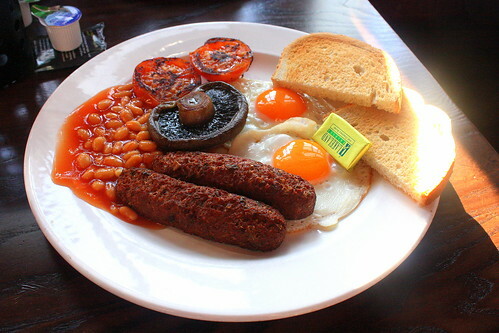 When I arrived in England, after a year of living in India, the first thing I ate was a vegetarian version of a full English breakfast- it was divine! Sunday dinner with cheese and nut roast! The first two weeks I was back in England, I was having two cheese, tomato and crisp sandwiches for breakfast! I couldn’t get enough of them! You may pick up on a theme here, I love cheese. The result of my food reunion? When you move to another country, it is not long until you start dreaming those foods you once took for granted, foods that your new country couldn’t care less about. You start thinking about absurd things you would do for just one mouthful, you find yourself bargaining with your own imagination. I had one of my food prayers answered this week when I found peanut butter. Wow, peanut butter. I have lived in India for nearly six months now and just holding a jar of peanut butter made me feel quite emotional! I thought about how excited I was when I found mozzarella, and the later disappointment I felt was when it tasted plastic socks (but I still buy it and still eat it, the ghost of cheese is better than no cheese at all!). This peanut butter probably wouldn’t taste like the British sunpat peanut butter I love so much. I noticed this Indian peanut butter was called sundrop, this half-plagiarism added to my doubt. If they couldn’t think of an original name, could they make good peanut butter? I bought it anyway, peanut butter is peanut butter! That night I couldn’t sleep, Alfonso and my husband had already been sleeping deeply for hours. I had just finished my book, ‘Veronika Decides to Die’ by Paulo Coelho, the ending was so lovely and thought-provoking it was hard to drift off. My solution to this (along with many other simple problems) was to make a cup of tea, I left the luxury of our air-conditioned bedroom and stepped out into the kitchen. When the temperature reaches 48oC during the day, the heat lingers all night. I am sure you could cook food in that kitchen without using an oven or stove. I remembered the peanut butter. I stuck a spoon into the warm, soft peanut butter. The Tavares song, ‘heaven must be missing angels’, instantly started playing in my head. I started to dance around the silent furnace savoring the moment, sundrop tastes just like sunpat. Oh, sundrop. How could I have ever doubted you? I went back to bed, straight to sleep and dreamt of marmite. Oh, what I would do for a taste of marmite!